The KNIME WebPortal allows data scientists to deploy their workflows as interactive, browser based applications. The KNIME WebPortal is a feature of the commercial KNIME Server that takes a KNIME workflow containing Quickform and visualization nodes and automatically creates a browser based application. 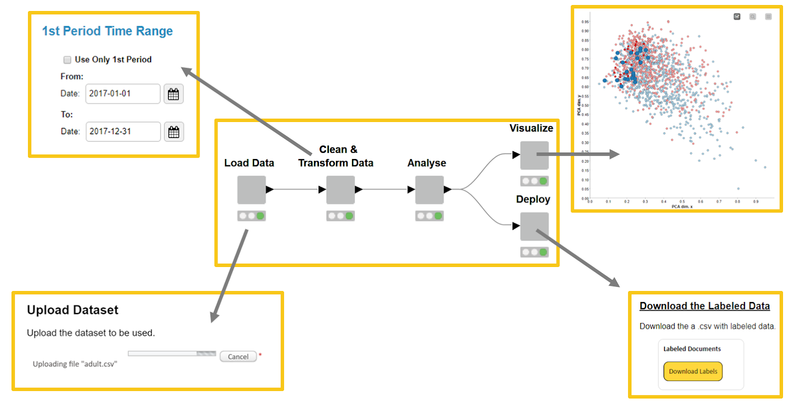 Users of KNIME Analytics Platform focus on designing data science visualizations as well as Guided Analytics and Guided Automation applications without writing complex code. KNIME Server then automatically delivers the results as web applications to the KNIME WebPortal - exposing analysts and subject matter experts to just the right amount of complexity. A major benefit of the KNIME WebPortal is efficiency and speed in deploying Guided Analytics and Guided Automation. Applications for a wide range of business analytics can be quickly deployed with centralized IT management. The Visual Layout Editor enables data scientists to drag and drop Quickform and View components in order to define the web page layout and application content. This code-free method makes creating and adjusting layouts simple. The KNIME Server Workflow Repository makes finding and sharing workflows and nodes simple and secure. Data science teams get a collaboration service that provides visibility, access control, and management of workflows, nodes, and data. KNIME Analytics Platform and the KNIME WebPortal provide development functionality and deployment services for Guided Analytics applications. Data scientists, developers, and DevOps staff are provided with a complete platform for productionizing interactive, analytical business applications.